Human life, of course, comes to mean little in wartime, and this is reflected in wartime stamps to some degree. In 1943-44, the Soviet Union issued a gory stamp in red and brown showing as its primary image a Russian soldier bayoneting a Nazi soldier. In the background is a ghostly image of a Russian cavalryman of an earlier war -– presumably the First World War – running down an enemy foot soldier. There can't be many stamps with a bloodier subject. Wars always create both heroes and war criminals, but whether a person is a hero or a criminal seems to depend largely on one's viewpoint. A case in point is General of the S.S. Reinhard Heydrich, the Reichsprotektor of Czechoslovakia, also known as the Assassin of Prague. Heydrich, who was the primary architect of the Holocaust, was sent by Hitler to rule Czechoslovakia to ensure a steady flow of Czech arms into the German army. He did so with a heavy, bloody hand, and on May 27, 1942, he himself was mortally wounded by a grenade thrown into his Mercedes by a British trained assassin, Josef Gabcik. Heydrich died 10 days later, and the Nazis responded by killing not only Gabcik but hundreds of innocent people in the tiny village of Lidice, where Gabcik had been born. Lidice, in fact, ceased to exist. The philatelic fallout of Heydrich's assassination was immediate. The Nazi government of Bohemia & Moravia issued a stamp and a souvenir sheet featuring a death mask of Heydrich and the double lightning bolt symbol of the SS. The souvenir sheet was distributed to Nazi leaders who attended the funeral, and today is a philatelic rarity. The death-mask stamps are commonly available, especially in mint condition, and have little value. After the war, in 1945, Czechoslovakia commemorated Gabcik's heroism in a set of stamps featuring Czech heroes who fought for the Allies. And every five years, for decades after the war, Czechoslovakia also issued stamps commemorating the destruction of Lidice. Many stamps were issued by the various Allied nations that occupied Axis nations following the war. Germany, for example, was divided into French, American, British and Russian zones, and each one issued stamps for the use of the people in their zone. The Allied Military Government (AMG) issued its own stamps for use in Occupied Italy, and overprinted Italian stamps as well. Immediately after the war, many of the victorious Allied nations issued so-called "Victory" stamps. Some of these were ordinary postage stamps overprinted with a "V" or the word "Victory." Some countries designed special Victory stamps. Stamps alone do not tell the story of the First and Second World Wars. 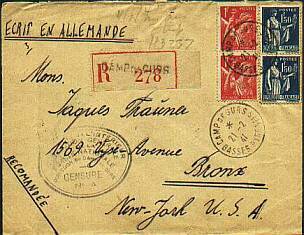 When they were used for their intended purpose, to carry the mail, they entered the realm of postal history. 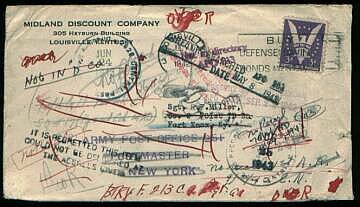 Today, collectors eagerly seek wartime covers. Through their postmarks, rubber-stamp impressions, censorship tapes and stamps, and handwritten notations, these covers, which are really unique artifacts, reveal much about the social, economic, political, military and economic history of the period. Such covers include censored covers which were opened by government censors; "paper-saver covers”, which employed previously used envelopes for a second mailing; "blackout" covers used to foil enemy spies; "catch me if you can” covers, featuring multiple stamps and redirections for soldiers who moved so frequently that their mail couldn't catch up with them; slogan cancels related to the war, such as "Conserve Coal -- Save One Ton in Five." Some collectors have taken on the historically important task of documenting the philatelic history of the Holocaust. It must be sobering indeed to handle covers that are all that remains of millions of victims of the Nazi concentration camps. The collector interested in the Second World War does not have to concentrate on material just from the war years. The Second World War was such a monumental upheaval that it continues to affect daily life even today, more than 50 years later. It's not surprising that governments continue to issue stamps that relate in some way to the war. The study of these modern issues alone will reveal much about period of world war that is the heritage of every person on earth today.